You never know if you are going to fall in love with the food in a new city, or if you eat and are always disappointed. 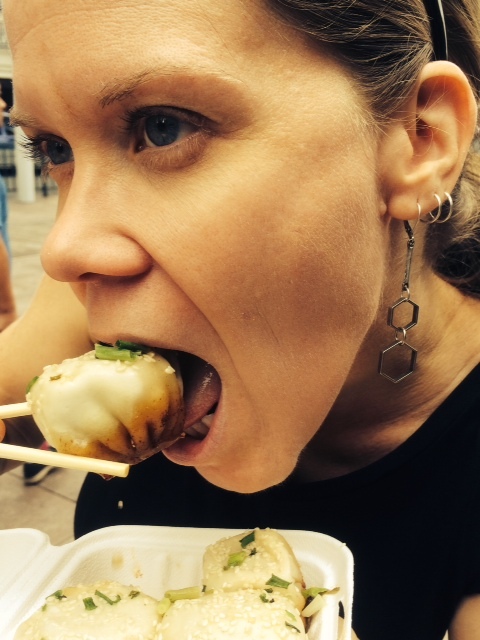 During my two-week visit in Shanghai I tried to always eat as local as possible. I only had a few western meals, and other than trekking all over the city to find a good green smoothie (actually just a real green smoothie), I stuck to trying new things. I have not been a fan of Chinese food in Portland. Most of the places we have tried have been too Americanized and are mostly bland options. For the most part Thai or Chinese food for us has been the quick “too tired, or too busy to cook” option. You do not really crave that kind of Chinese food, it is more of a convenience. So not really sure what to expect and knowing that I have definitely not really ever experienced “good” Chinese food, I jumped in head first. I thought I would share a few of my favorites. Xiao long bao is a kind of steamed dumpling (or bun) that is made in bamboo steamer baskets, and filled with a tiny amount of broth. They are usually served with slices of ginger, soy, and vinegar to dip in before popping in your mouth. I became addicted to the pork filled versions, although I also had some that had hairy crab inside. They have a thin, light exterior, and it is best to tear a corner and check the temperature of the soup, or just go for it and down it all in one bite, hoping not to burn your mouth in the process. They are little morsels of intense flavor and just so so so good. 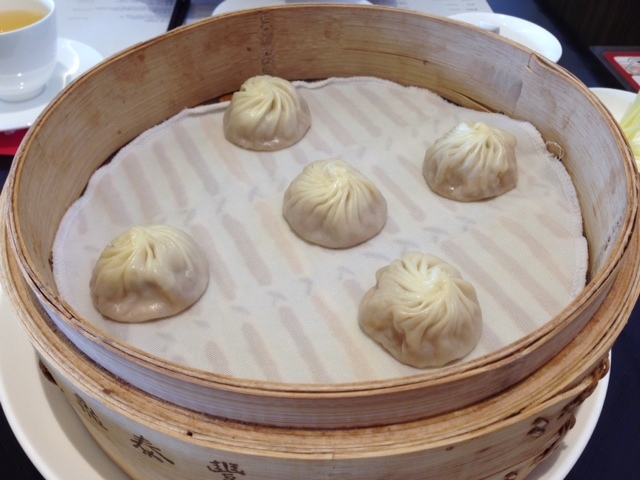 Favorite location: Din Tai Fung (for those of you in the US, there is a location in Seattle). Roadtrip soon, Chris? Their cousins or siblings are Sheng Jian Bao (fried soup dumplings) and take a close second for me. They are a breakfast speciality in Shanghai. Twice the size of the Xia long bao, also filled with pork and broth, but fried on the bottom. They also have a thicker exterior. 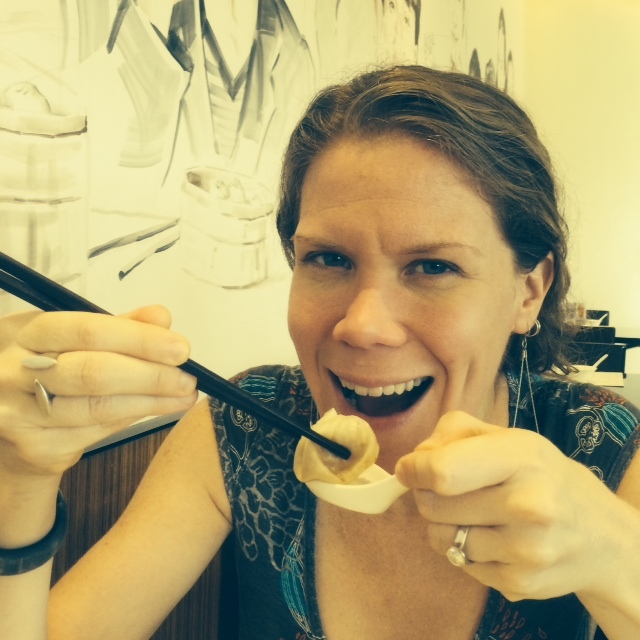 I tried other local Shanghainese food, with differing opinions. Some dishes were bland, some just not the flavor I would crave. Junk food, street food, fine dining. More items with beans then I can imagine. 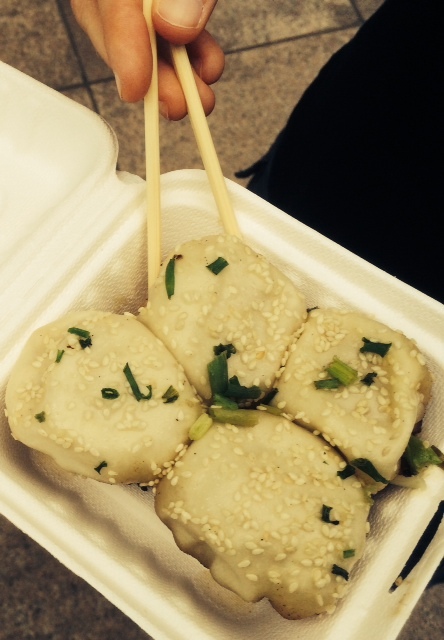 By far my favorite were these two versions of dumplings. I have already started the hunt of where I can find something even close as to as good in Portland. Dessert in Shanghai was few and far between. We usually were too full to care, but not in that ‘your pants are bursting’ kind of way. In more of a ‘that was amazing and I do not want to do anything to the flavors happening in my mouth’. 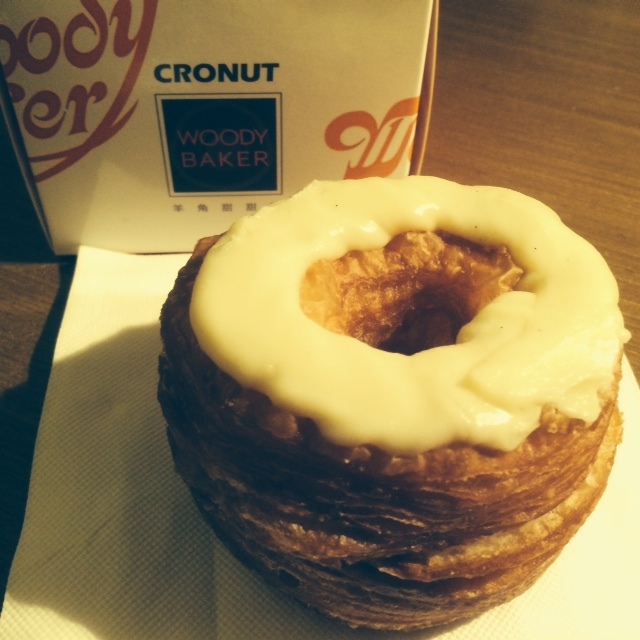 However, we happened across a bakery selling a Cronut (croissant + doughnut), we could not resist. Ever since we had heard about all the hubbub in New York City at the Dominique Ansel Bakery, we have always wanted to try one. While I appreciate that the fad has not blown up and been cloned all over the US, when you have never had one, and you see it in Shanghai, why not try it? They know that they are stealing the idea from New York City, but rather than completely steal the idea, we saw it marketed as “Cronut = Crack + Doughnut.” Whatever way they want to justify it, we found two bakeries that sold them. Worth it? Yes. I enjoyed trying so many unique and local dishes and will miss Xiao Long Bao, but the adventurer in me will see if I can find them locally. Or, maybe Chris will play in the kitchen and see how hard they are to make right at home. It’s funny – in Shanghai, i love some stuff and did not love some stuff. I did not love any one food or not-love any one food. My experience was more about the venues. My favorite restaurant was Lost Heaven but wasn’t able to get there much since I was staying near our offices at the Bund (Westin off of Henan Middle Road). I will admit that all of my breakfasts were from the Starbucks on Henan. Anyhoo – Lost Heaven was delicious and our dinners were all eaten family style and i love the different foods. What i did not love was the food i ate at the Westin which was their interpretation of american food! you’d get excited that you’re having a burger but when you eat it, hmmmm, doesnt taste like what i expected! I was lucky enough to meet up with some NYU Stern local alumni leadership one evening and after we talked about the work they were doing, i had fun watching the night life at the hotel! I will admit that i spent most of my free time at Nanjing road which was a block north of our offices. I was so intrigued by the sheer volume of people and how they interact. I also enjoyed walking to the side streets and visiting their stores as well. We went to Lost Heaven and stayed near the Bund. I agree per Western Food, and the crazy volumes of people!